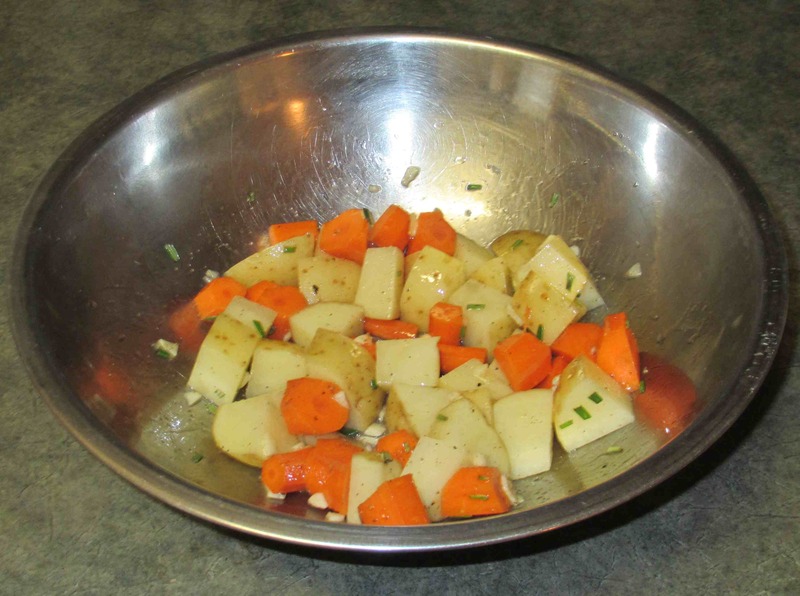 Peel the carrots and then cut the potato and carrots into irregular bit-sized chunks. Finely chop the garlic and Rosemary and then mix them with the vegetables in a large bowl along with 2 ½ tablespoons of oil and a pinch or two of salt and pepper. 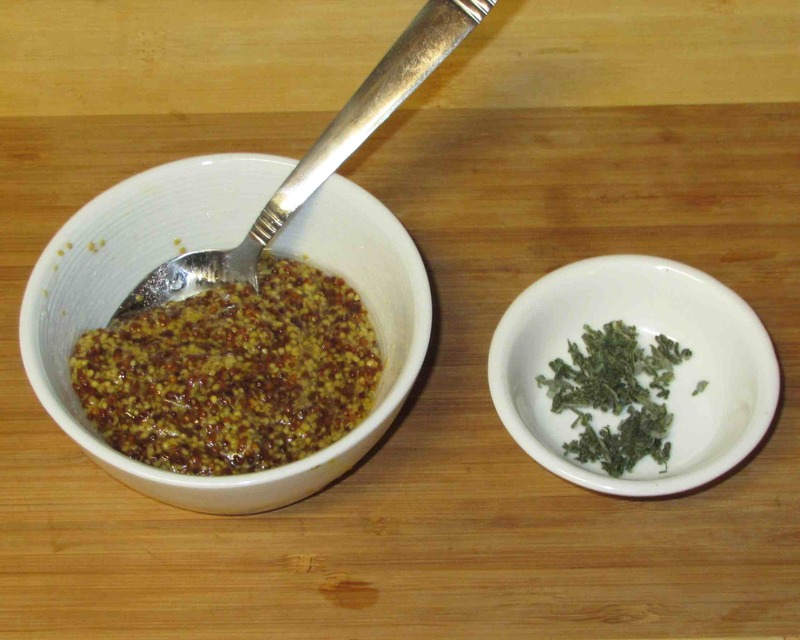 Finely shred the sage leaves and mix the mustard with a tablespoon of sugar and the remaining half-tablespoon of oil. 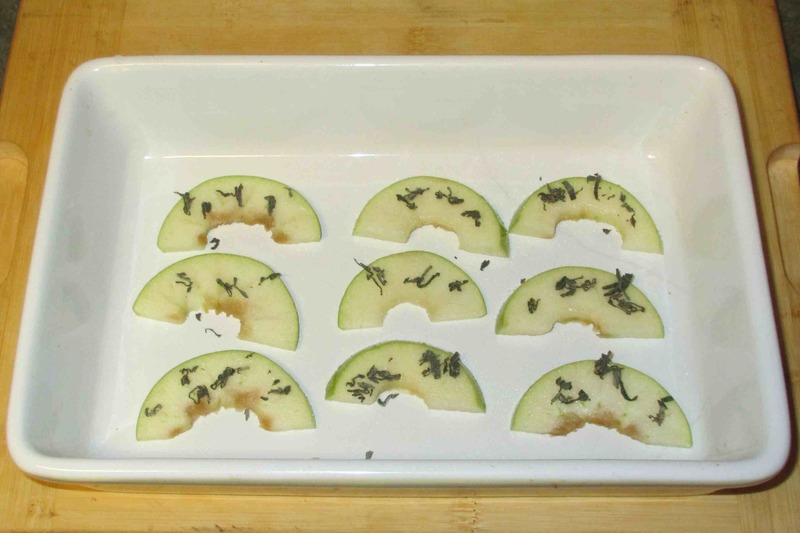 Core the apple, cut it in half through the top and then slice the halves thinly. Sprinkle the slices with the remaining sugar and sprinkle with the shredded sage. Make three cuts along the roast (going with the grain of the meat), about 1 – 1 ½ inches deep and insert apple slices into each cut. 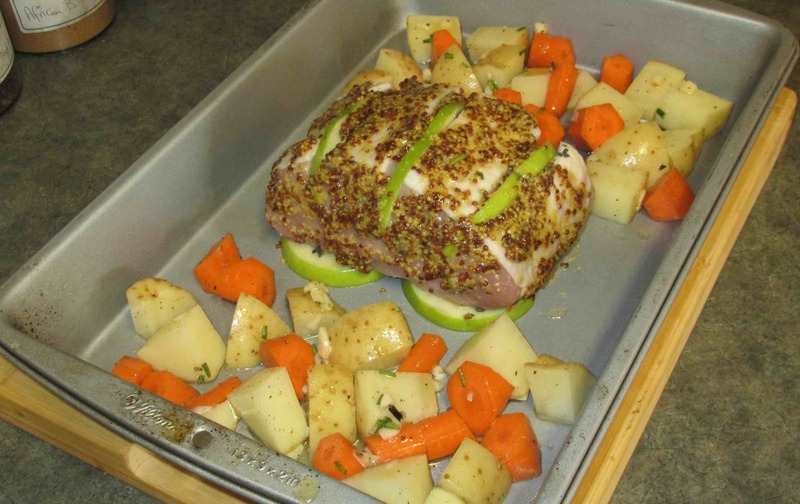 In a suitable roasting pan, make a bed of the remaining slices and lay the roast on top. Pre-heat your oven to 425 degrees and then slather the roast with the mustard mixture. Arrange the vegetables around the roast making sure that there is a lot of space between the individual chunks so that they brown evenly and roast rather than steam. Cook for 45 minutes or so, checking from time to time and stirring the vegetables as needed. 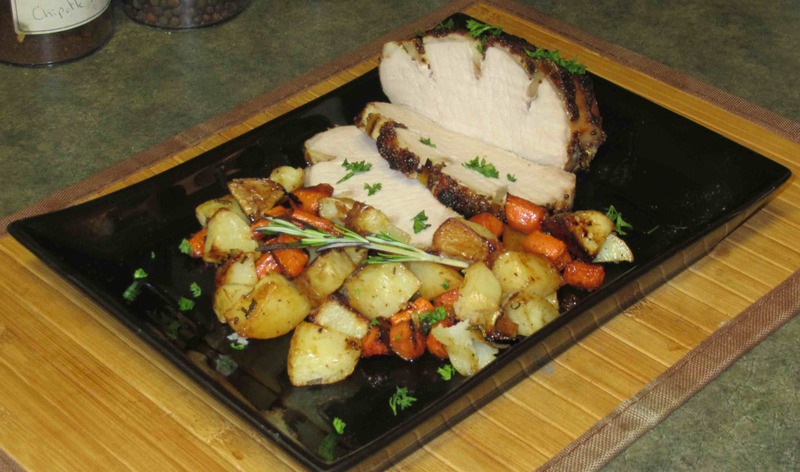 Allow the roast to rest for a good 5 or 10 minutes when it is done and then slice for service. I never really thought of this as autmnal, but it is, isn’t it? I like your idea of inserting apple slices in the pork. I will keep that in mind next time I am making pork roast. Thanks! 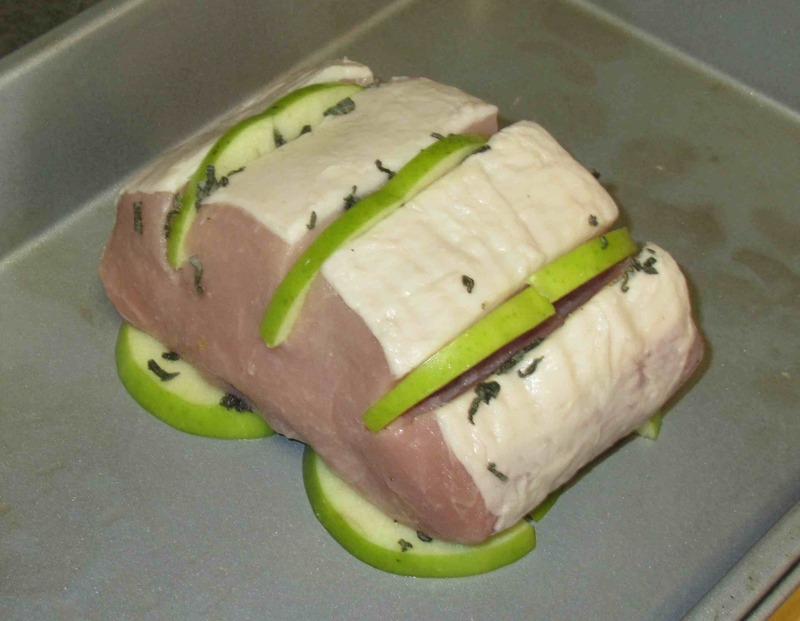 That looks delicious, and I would never have thought of putting the apple slices in the pork! 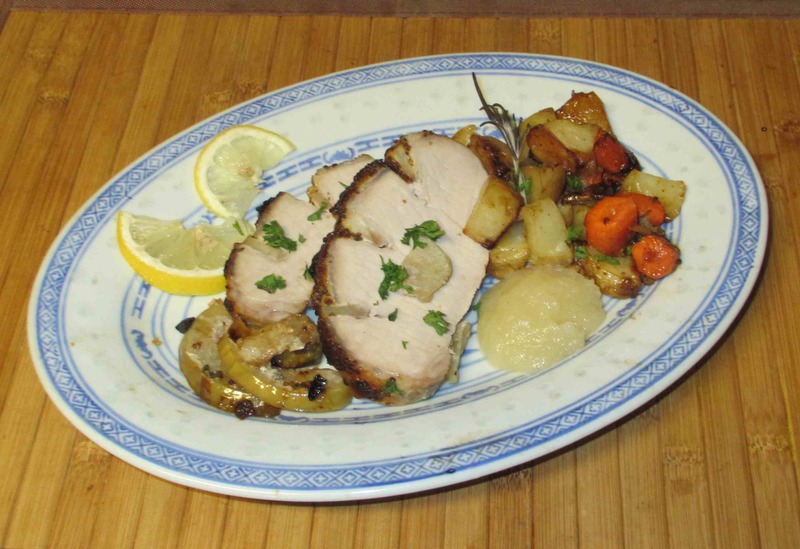 I think that is going to be a must next time I make pork loin! It’s so ingenious, and it made me think, why the heck didn’t I think of that before????? I’ve got to try this. We love pork, and I have fresh sage and rosemary growing outside my door. Your pictures of the prep and final dish are always fabulous. Thank you … I hope you do try it. Other sorts of mustard might be worth playing around with too. I made this roast tonight. It was delicious. Good blend of flavors and really easy. My husband thanks you! 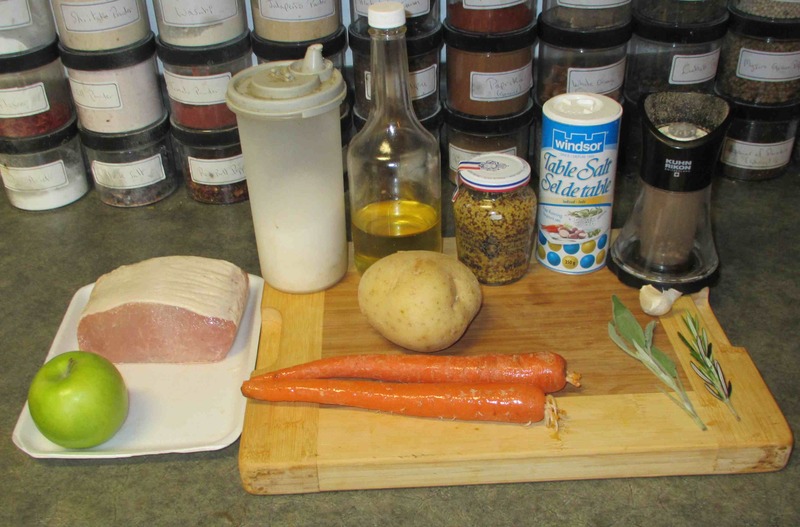 I added an onion to the roast vegetable mixture, which we liked. Thanks for your recipes. Next up – Kung Pao Chicken! Oh thank you! You are the first to resond after actually trying one of my experiments… I am *SO* glad it worked for you. Thank you! After the roast, my husband asked me what I was going to make next from your wonderful recipe postings! Your posts inspire me to get in the kitchen and cook! Looks creative, but need to try it out..! My sister just created a new recipe on roast pork, not the regular Chinese roast pork. Will share later in my foodblog.